As my readers know, I love making cute food with homemade bread. These were so much fun to make and my husband seemed to enjoy eating them. What bread theme do you want me to make next? 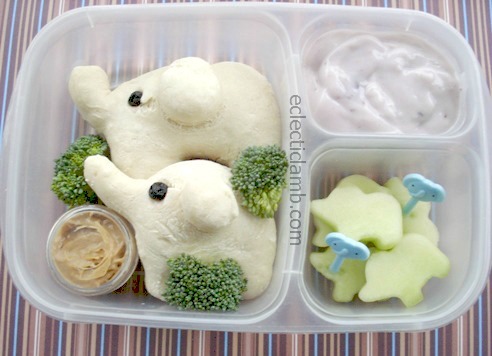 This entry was posted in Bento / Cute Food, Food and tagged animal, bento, shaped bread. Bookmark the permalink. Great idea, I will add it to my list! They are so cute, how can you make the big elephants? Thank you so much for your suggestions! I did a Teddy bear once as a guest post – http://littlebentoblog.com/teddy_bear_kathy/ I could try to make a wild bear. I made a piggy bank for another guest post http://lovinglunches.blogspot.com/2013/08/loving-guests-eclectic-lamb.html#.UoOYZyf5mSo but I could make pigs not as a bank. These are beyond cute!! So trying this at some point! Thank you so much! Please share when you try them. I simply love those elephants! They are so cute! Great job! So cute and creative!!! The elephants turn out really well. Thank you Winnie! I will put them on my list. Congratulations for being Bento of the Week!